The euro vs dollar appears to be finally breaking out of the recent sideways consolidation and beginning to roll over and move lower on the daily chart. 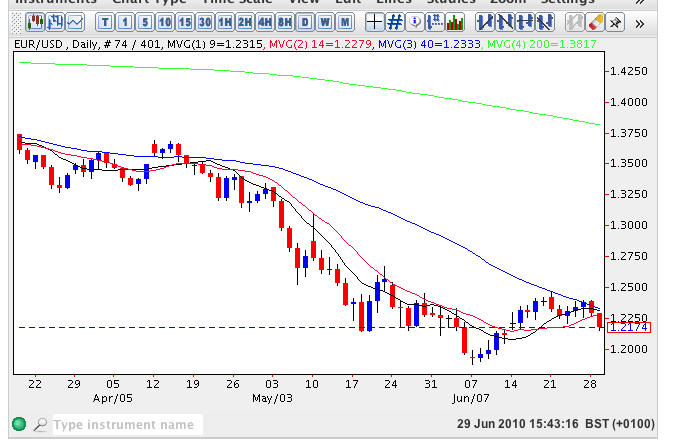 Whilst yesterday’s down candle hinted at this possibility it did find support from the 14 day moving average from the forex trading session but in this morning’s London session this key technical indicator was breached with the euro vs dollar trading at USD1.22 at time of writing and as the New York markets open. At present our three shorter term moving averages are entangled and we cannot therefore rely on them for any clear signal. However, provided we see a re-test of the USD1.20 area which should occur relatively quickly then the moving averages will become increasingly significant as a result. In the medium term expect to see a re-test of USD1.18 and a move to this price area may signal a further move lower in the longer term.